A Splash of Freshness. Surprising and enchanting, the Ginger Lotus line captures a clean, unique fresh scent of Ginger and enhances it with dashes of Cardamom, Bergamot, Ginseng, Lotus, Coriander and Jasmine. For a finale, this inimitable combination is enriched with extracts of Lotus Flower selected for its superbly relaxing properties. 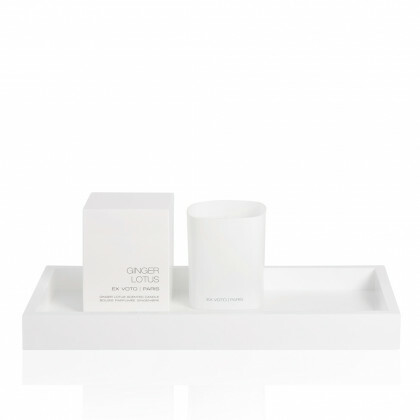 Elegant and refreshing, the Ginger line enhances a peaceful, refreshing vibration and reveals a new interpretation of purity. Splash of Freshness. Delicately scented, this exquisite Ginger Lotus hand & body wash provides a refreshing feeling thanks to a unique, clean fragrance. 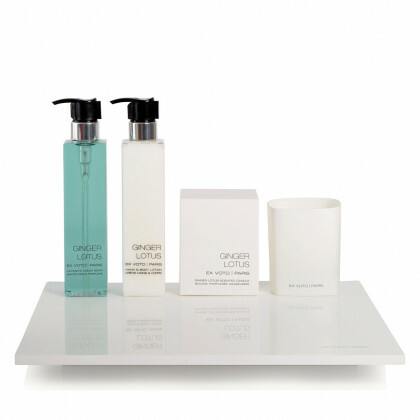 Enriched with soothing Macadamia Oil, organic Calendula and Olive Leaf extracts, the Ginger Lotus gently cleanses the skin, leaving it fresh and delicately perfumed. Pure Bliss. 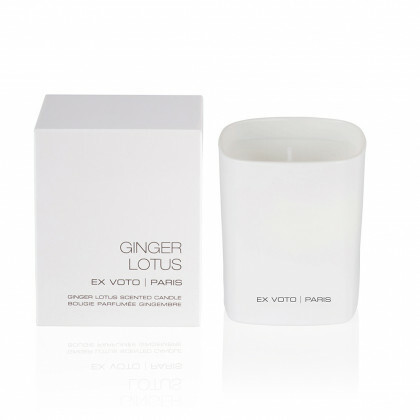 Intriguingly Delicious, the Ginger Lotus scented candle reveals an alluring, fresh Ginger scent, enhanced with refined Bergamot, Lotus, Sicilian Lemon and Jasmine on a sophisticated undertone of peppered notes of Cardamom, Coriander and Clove. Elegantly silk-screen printed, sleekly encased in a glass vessel tinted in white color, the Ginger Lotus is a blend of pure freshness. Exquisite Beauty. 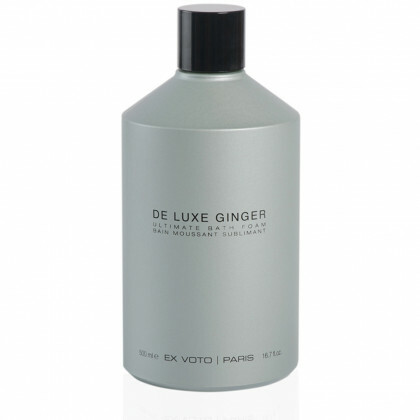 Presented in a sumptuous glass botlle of 500 ml, the De Luxe Ginger bath foam captures the clean, unique fresh notes of the Ginger scent and enhances it with dashes of Cardamom, Bergamot, Ginseng, Lotus, Coriander and Jasmine. For a finale, this inimitable combination is enriched with extracts of Lotus Flower carefully selected for their relaxing properties. Delightful Purity. 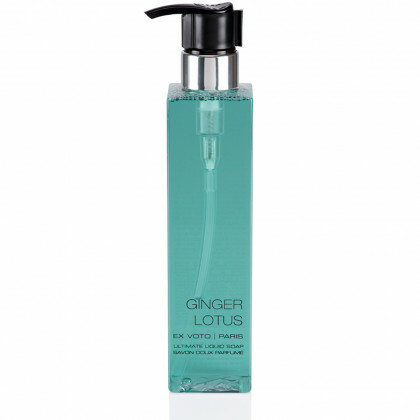 The Ginger Lotus shower gel provides a refreshing feeling thanks to a unique, clean Ginger fragrance. Formulated with soothing Lotus, White Tea extracts and Vitamin E, this shower gel cleanses the skin leaving it fresh and delicately perfumed. 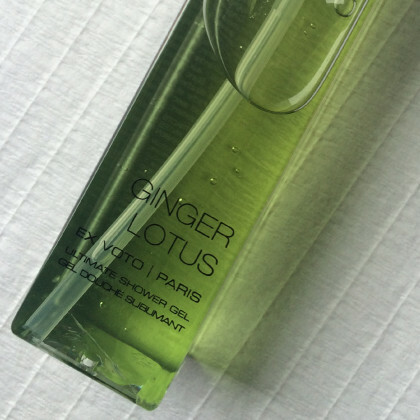 Elegantly designed in crystal-clear bottle with a green color, the Ginger Lotus shower gel is an invitation to relaxation. Peaceful Serenity. 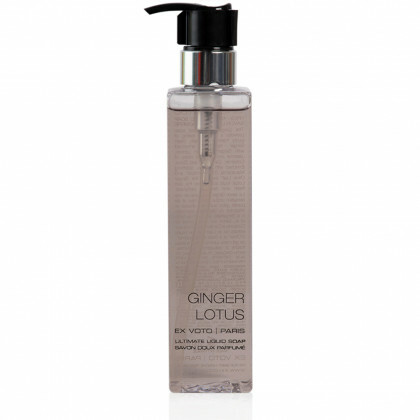 The Ginger Lotus massage and body oil provides a relaxing, calming feeling thanks to its subtle Ginger fragrance,. 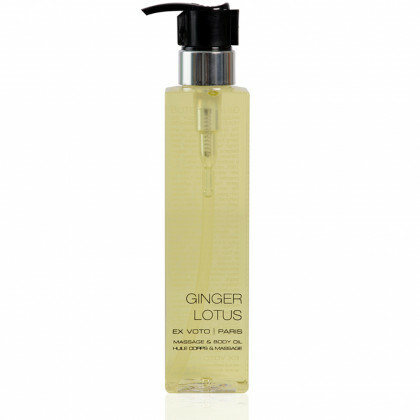 Formulated with a soothing blend of Vitamin E and 100% natural Grape Seed Oil, with antioxidant and softening properties, the Ginger Lotus massage & body oil can be used on dry or wet skin.